Design aesthetic can be the make or break feature that makes one vehicle better in the long run over another. How a vehicle looks and feels goes a long way in making you want to be in it as much as possible. The new Audi S4 is a sports sedan that readily invites drivers in with its design elements. Shortly after you arrive at Mohegan Lake Audi, you will discover why the Audi S4 is such a pleasing vehicle to be in. The sleek yet sophisticated exterior is both striking to the eye making it an attention-getter as you drive around town. 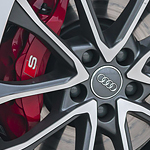 Once you settle into the Audi S4, you will be greeted with by a stylish yet highly functional steering wheel. The wheel itself has a unique design which comes in the form of three spokes with a flat bottom. The steering wheel also contains the means to control a variety of functions and also includes paddle shifters.